The 3M Fasara series is comprised of different decorative films that bring a design aspect to a space, as well as blocking 99% UVA/UVB rays. 3M Fasara films work great if you are trying to increase privacy in a space or incorporate design. Provides the look of sandblasted glass that has an opaque look and increases privacy in a space. Will hinder the ability to see in or out. Allows 85% visible light transmittance. 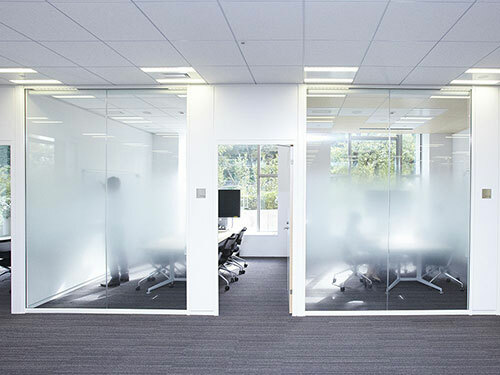 An opaque window film that hinders the ability to see in or out of a space and increases privacy. Allows 19% visible light transmittance. An opaque film that hinders the ability to see in or out of a space and increases privacy. Allows 21% visible light transmittance. Provides the look of sandblasted or etched glass that has an opaque look and increases privacy in a space. Will hinder the ability to see in or out. Allows 72% visible light transmittance.